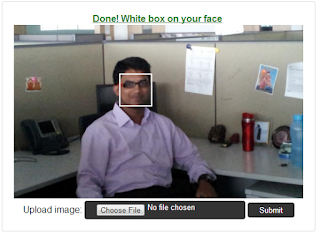 Facebook Like Automatic Face Detection Using Jquery | Web and mobile development tutorials. I really wonder when I first time read about it. I have no idea that jquery can do it. But yes. We have amazing plug-in to do it. Facebook using similar kind of code to detect faces on image. In this post I am gonna show you how this plug in works. In this first we upload an image and click a star button. It will automatically Detect Face in your Image. Another great thing about this plug in is, It can detect multiple faces. Here we adding all required plugin files. Add this code just above the Tag. Add this code just above the closing body tag(). Here we invoking facedetect Plug in. This is really amazing jquery plug in. You can use in your web app very easily. It is so easy to integrate. Only thing to remember it you need to use web server to run this plug in. You can’t invoke it from file system.